SNES Chester Cheetah: Too Cool to Fool (USA) in 11:05.85 by dekutony. Chester Cheetah: Too Cool to Fool is a 1992 video game that starred Cheetos mascot Chester Cheetah, and was only released in North America. The game is composed of simple side-scrolling platform levels. On each level there is a hidden "scooter" part. 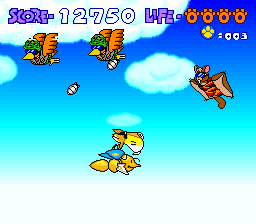 Chester can dash and stun various enemies by jumping on their heads. Author dekutony beats the game in record time. We also have a run of the game's sequel.